Only one U.S. president is buried on the grounds of a state capitol, and he belongs to us. This Thursday marks the 168th anniversary of the death of James K. Polk, 11th President of the United States and the second of three Tennesseans elected to that office. For now, anyway, it looks like Polk and his wife, Sarah Childress Polk, will remain at the Tennessee state Capitol where they’ve been for more than a century. Which is as it should be. Burying a person in three different graves is more than enough. 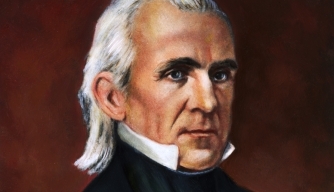 For those who might be a little rusty on history, I’ll remind you that although Polk accomplished many impressive things during his single term as President–including expanding the size of the United States by one-third, reorganizing the treasury and the postal system and creating the Naval Academy–he kept his promise not to seek a second term. Sickly all his life, Polk died of cholera on June 15, 1849, just three months after leaving office. To prevent the spread of the highly contagious disease, victims of Nashville’s cholera epidemic—including President Polk—were buried in a mass grave in the city cemetery. In May 1850, at the request of his widow, the president’s body was moved to Polk Place, their magnificent mansion in downtown Nashville. Sarah lived until 1891 and was buried beside her husband, but Polk Place was soon sold and scheduled for demolition. What to do but move the couple to another “final” resting place, this time at the state Capitol? That’s where they are today, their lovely but modest tomb overshadowed by impressive statues of Tennessee’s other two Presidents, Andrew Jackson and Andrew Johnson. Last March, the senate passed a resolution approving the measure. That resolution didn’t make it to the house or the governor. Those who oppose digging up Polk’s body and burying it a fourth time say such a move would be costly and disrespectful and is nothing more than an attempt to increase tourism in Maury County. The fact that Andrew Jackson is buried at the Hermitage and Andrew Johnson in his hometown of Greeneville is not good enough reason to disturb Polk again. I’m on their side. “The mortal remains of James Knox Polk are resting in the vault beneath,” the inscription on his grave reads. It’s high time to let those mortal remains rest in peace.